Hi lovelies! It has been a very busy few weeks, much busier than I could possibly fit into 9 photos! So, I've just picked a few out and I'll update you all on what else has been going on very soon, ooh mysterious. It's basically just been the craziest few weeks and so much has gone on, mostly good and some not so much but overall pretty exciting and jam packed! I've been trying to concentrate a lot more on spending time with friends and family and getting right back into regular blogging, as I had been letting it slip a bit where I'd been so busy with other things which I hate doing, my blog is so important to me and I hate not having the time to do it! 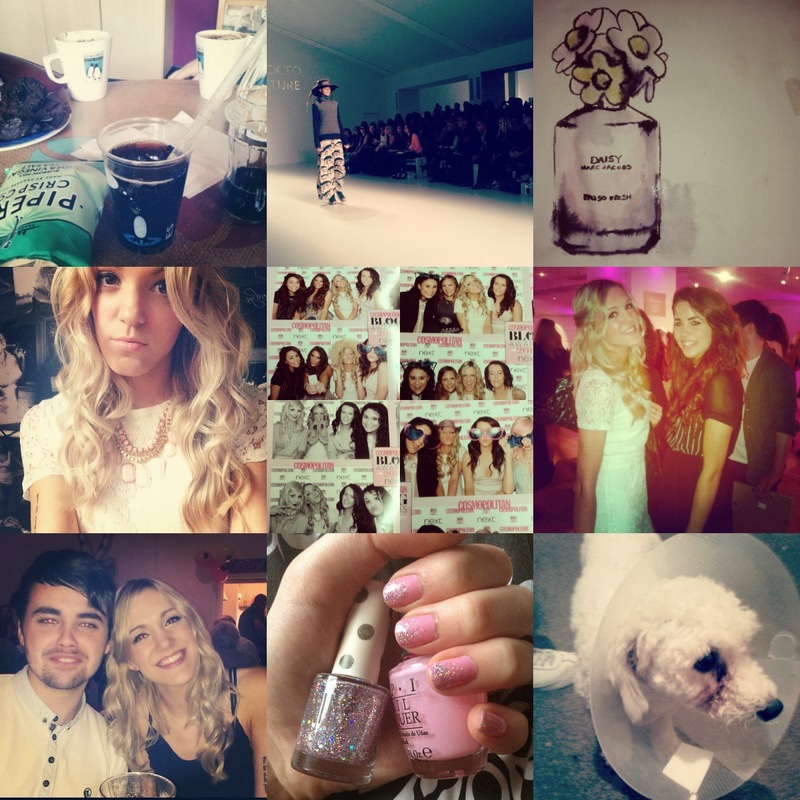 A couple of things may stand out more than others in this post, such as the LFW picture and the Cosmo Blog Awards! I've posted individually about both of these things, so you can check those out if you'd like to. Both were absolutely amazing and both events I never in a million years thought I'd be able to attend, but thanks to my teeny tiny little corner on the internet and of course all you lovely people, I was able to go and I honestly can't thank you guys enough! I've been feeling a bit sentimental about a lot of things lately and my blog and my followers are definitely one of them. I think it's amazing how many lovely friends I've made and how many people I've connected with just through blogging, it's completely overwhelming when you think about it. I think I'm feeling another blogging advice/ ramble about blogging post coming on. In other news, I've recently added a blog shop to my little list of pages up the top of my blog, it's a lot more user friendly than my old blog sale, so if you click 'raid my closet', you'll find it there! You may have also seen in my more recent post, I've made a few changes to my ad packages, they're now more suited to each blogger, with individual tweets and blog posts etc etc, I just wanted to give a little something extra with my ad packages so hopefully I've succeeded in doing so! Anyway, this post has ended up a lot more rambley than expected, so I'm going to be quiet now! You looked gorgeous at the Blog Awards!!! Very interesting information! Perfect just what I was looking for! you are awsome writer, i love your site.